UCSD secures only one victory out of five contests against San Diego State University this past Friday. This past Friday, the UCSD women’s crew team could only secure one victory at Mission Bay out of five races against cross-town rival San Diego State. The meet marked the rowing squad’s third event of the year, having posted solid performances at the Sacramento State Invitational and the Opening Day Regatta in Long Beach earlier this month. UCSD’s only victory of the morning came from the Novice 8 event in which the women finished the 1,930-meter course in 6:59.7. SDSU crossed the line at 7:04.5, nearly five seconds after UCSD. “The novices carried the day, and the future looks very bright for the athletes in this boat,” Triton head coach Colin Truex told UCSD Athletics. 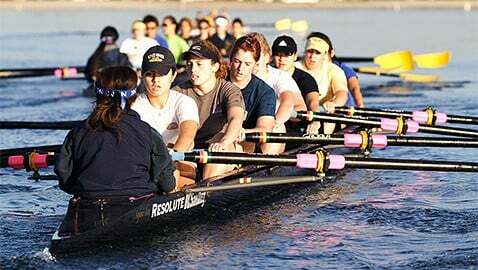 In the Varsity 8 duel, UCSD started off strong, taking an early lead. However, SDSU mounted a comeback to finish at 6:33.4, while UCSD rowed in seven seconds later at 6:40.8. The Aztecs were also victorious in the JV 8, Varsity 4 and Open 4+ races. Their largest margin of victory came in the open four race in which SDSU was able to finish 41 seconds ahead of the Tritons. Although UCSD fell short of the results they had hoped for, Truex was optimistic about his crew and their performances. At the very least, Friday’s competition was crucial for the Tritons in gaining experience and preparing for next week’s meet. “It was a perfect way to tune up for the next two huge races that we have coming up,” Truex said. The Tritons will look to get even with SDSU when they face the Aztecs again next Saturday at the annual San Diego Crew Classic in Mission Bay.